1. The annual festival of the Order to be held on the anniversary of the accession to the throne of the present Emperor. 2. The Order to bear the name : The Order of Francis Joseph, with the motto "Viribus unitis". 3. The Order to be conferred on individuals of distinguished merit, without regard to birth, religion or rank. 4. The members to be nominated by the Emperor himself, their number being unlimited. 5. The dignity of Grand Master to be inseparably vested in the Austrian Crown. 6. The Order to consist of three degrees : Knights of the Grand Cross, Commanders, and Knights. 7. The badge of the Order to be a gold enamelled Cross, externally octagonal and bent forward. The Cross in itself is red, with a golden ring round it. The middle scutcheon is circular and white surrounded by a golden stripe, and contains on the obverse the two letters F. J. (Franciscus Josephus). Between the four arms of the cross is visible the two-headed crowned eagle in gold, partly enamelled black, holding in his two beaks a golden chain, in the lower links of which is the motto : "Viribus unitis". The reverse of the cross is the same as above described, with the only difference that (the year) 1849 is substituted for the letters F. J. The Knights of the Grand Cross wear the badge by a deep red ribbon, four inches wide, across the right shoulder, and at the side of it, on the left breast, an octagonal silver star, the centre of which contains the decoration as described above in the obverse of the Cross. The Commanders wear it round the neck, suspended by a similar red ribbon about two inches wide. The simple Knights suspend it on the left side at the button hole, suspended by a similar ribbon about one and a half inches wide. On ordinary occasions, the members may wear the Cross in a diminished form at the button hole, suspended by a small golden chain. The form of the chain is described in "Bavaria", (A. B. and C.) Fig. 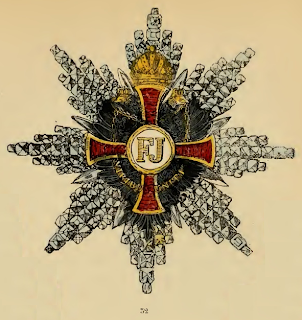 A. exhibits the large chain of the Grand Cross Knights ; Fig. B. that of the Commanders ; and Fig. D. the smallest one of the Knights. The centre scutcheons of the eagles in Fig. B., and the scutcheons with the golden crown in Fig. C. are white enamelled, while the letters F, I. in Fig. D. are red enamelled. Members are not allowed, without special permission, to wear the Order adorned with precious stones, though they are at liberty to do so with their family crests. The grant of the Order does not entitle the wearer to any degree of nobility, or any other hereditary distinction.